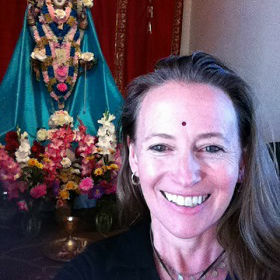 Aditi Devi began the study and practice of South Asia Tantric traditions more than 25 years ago. As an initiated yogini, pujarini(ritualist, priestess), lineage holder, and authorized teacher, she has lived and practiced her sadhanawith adepts in Nepal, India, and Tibet. Having received numerous traditional Tantric empowerments and transmissions, Aditi Devi Ma’s practice, teaching, research and writing focus on the embodiment of the divine feminine in the Shakta Tantric lineages of India and Nepal. She earned a Ph.D. in Anthropology and Asian Studies, and was a Fulbright Scholar and college professor. 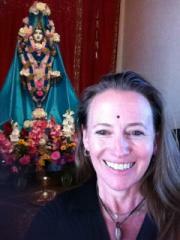 Aditi Devi is authorized to teach what are referred to as the Kali Practices focusing on the reverence of women as embodiments of the divine and awakening in the body, in deep relationality. These practices have their fullest expression in Assam, at the Temple of the Tantric Goddess Kamakhya, a yoniGoddess who is revered throughout South Asia (and indeed the world); this is one of Aditi’s spiritual homes and practice seats. After several years of living in a remote contemplative community, Aditi has taken to the wandering life again, bringing her offerings to yoga retreats, teacher training courses, festivals, godowns, and wherever yoginisand yoginsgather. She recently returned from pilgrimage in India where she followed the trail of fierce desire, visiting several remote Yogini Temples. Aditi Devi’s first book on the Kali Practices is now availble.